These same people were also happier on days when they were more physically active than usual, meaning that upping the ante on workouts can provide even more of a happiness boost. The takeaway? Working out can make you happy long term; adding extra intensity can make you feel even better. Another experiment used a smartphone app to have participants track their activity, location and happiness levels throughout the day. It received more than 3 million responses a year — and users were at their second-happiest post-workout. Whether it’s deciding to run a 10K, increasing the amount you can deadlift or increasing your bike mileage, setting and achieving fitness goals is an incredible self-confidence boost. But if you find your resolutions falling to the wayside, science has uncovered the secret to success: setting clear intentions. Guess who was most successful? Group three had a much higher rate of actually following through, at a tune of 91 percent, while the control group exercised at least 38 percent of the week. The motivation group actually exercised the least, with just 35 percent. 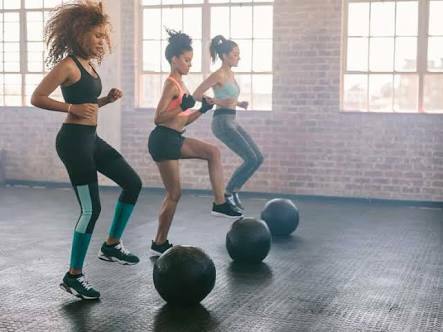 By discovering the power of goal setting by committing to reaching an exercise milestone and then working out just how you’ll achieve it, you can enjoy the benefits of exercise and the confidence that comes along with it. Get out of the medicine cabinet and reduce your risk of heart disease the natural way. A meta-review of a variety of studies and trials conducted by researchers in 2013 ­— encompassing 305 trials with more than 339,000 participants — found that no statistically detectable differences existed between those who exercised and those who were given medications in the prevention of coronary heart disease and prediabetes. In fact, in those patients who already had suffered a stroke, physical activity interventions were more effective than drug treatment. Work with your doctor to set up an exercise plan that works for you. If you can’t sleep and instead are prone to tossing and turning, exercising can help you sleep better. By strengthening circadian rhythms, exercising can help keep you more bright-eyed during the day and bring on sleep at night. It also promotes better quality sleep. While the effects may not be an immediate quick fix — a recent study found that it can take up to four months for those beginning an exercise routine to have a positive effect on sleep— starting a working out plan is the only way to ensure you’ll sleep soundly every night. When you’re feeling exhausted, the last thing you might want to do is squeeze in a workout. But, according to experts, that’s exactly what you should do. They found that low-intensity exercise, the equivalent of a leisurely stroll, experienced a drop in fatigue levels and a 20 percent energy boost. Even more exciting is that the low-intensity exercise group’s fatigue levels dropped more than the higher-intensity group, great news for those who might skip a workout because they don’t have time or energy for a more intense session. Both groups reported steadily increased energy over the span of the six-week experiment. If strength training and stretching aren’t a part of your fitness routine, it’s time to incorporate them. Though many adults engage in cardio activities, quite a few stay away from resistance training and building muscle — and that’s a mistake. Strength training, whether you’re lifting weights, doing bodyweight exercises or incorporating yoga moves, helps improve muscle strength and muscle mass, particularly important as we age. It also keeps bones strong, thus serving as a great natural treatment for osteoporosis. Plus, increased muscle helps your body burn calories more efficiently long after your workout is over. And don’t forget about stretching: It increases your body’s flexibility, helping everyday tasks become easier. It also sends more blood to your muscles, improving circulation, and can lower the risk of cardiovascular disease. Just a few minutes a day of deep stretching can make a difference. Are you constantly misplacing your keys or struggling to recall names? Exercising regularly can help jog your memory. A 2014 study found that aerobic exercise, like running or swimming, boosts the size of the hippocampus, the part of the brain responsible for memory and learning, in women with a recognized risk factor for dementia. Besides looking to brain food to boost your memory and mental skills, start breaking a sweat! Feeling down on yourself? Exercising can help you feel better about yourself ­— no matter what type of workout you do or how fit you are. One study found that “the simple act of exercise and not fitness itself can convince you that you look better.” With so much emphasis on our outward appearances in society today, it’s comforting to know that one of the benefits of exercise helps people feel better about themselves and how they look naturally. Could the key to being more productive and happier at work lie in exercise? One study thinks so. It found that those employees who worked out before work or during their lunch hour reported feeling less stress and being happier and more productive than days when they skipped a workout. Not only that, but they also performed better on exercise days. It’s the perfect excuse for a lunchtime stroll or walking meeting. Being there for our loved ones and enjoying as many special moments together as we can — that’s what life really is all about. Keeping your body happy and healthy to help you live a longer, fuller life is one of exercise’s biggest benefits. Therefore, it’s great news that research published in 2012, which studied more than 650,000 people, found that 150 minutes of moderate exercise (or about half hour five days a week) increases your life span by 3.4 years. Regular trips to the gym are great, but don't worry if you can't find a large chunk of time to exercise every day. To reap the benefits of exercise, just get more active throughout your day — take the stairs instead of the elevator or rev up your household chores. Consistency is key.